Thanks be to God who does wondrous things. Hey there! Thanks for dropping by Catholic With A Vengeance +++! Take a look around and grab the RSS feed to stay updated. See you around! The church seemed all but empty. Lined up like sentries, the pulpit and candlesticks kept silent watch. I knelt at the wooden altar rail before the tabernacle, my nostrils took in lingering, sweet incense and my eyes fell upon the wooden high-altar, where our sacrifice was just offered. Jesus truly was in this place. I felt in my very bones. He gazed upon me as I gazed at Him. No, this was not my parish church but oddly enough, it seemed more like home than the parish church. So different, yet oddly familiar. Here amidst silence, the carved wood, the tall candlesticks and lace, remembering a simple, beautiful liturgy marked with chanting, bowing and many signs of the cross, I felt I finally belonged. Moreso, I felt fed, heavy with the fat things of the earth, lavished by the gifts of heaven. Something moved from behind me and I caught sight of a figure in a sweeping, black cassock. Wasting no time, he took the three, blue scapulars from me, strode to the altar and set them down. He faced the crucifix, speaking prayers under his breath. Immediately, the memory of him, up there in flashing, red vestments, burned through my mind. He who offered the greatest sacrifice for me, now said this small blessing. He who entered the heavenly courts now did what seemed, a very earthly thing, tracing a cross in the air and sprinkling holy water. This priest and I weren’t strangers. Every time my friend Leo brought me to this church in Orlando, a good hour away, I’d told him about my parish. I mentioned how barren and dead it indeed seemed compared to this lively place of wood, candle-wax, reverent song, of silk, linen, lace and black. Yet I didn’t need to say anything today. The tears in my eyes during the Mass said enough. My trembling as I approached the altar showed the pining of my heart. “Thank you, Father,” I replied, looking directly at him. A twinkle showed in his eye. Here was a man who knew what he was talking about, who perhaps tasted bitter exile himself. On his way from the sanctuary he passed the crucifix. I stared at the heavy beams, carrying their sweetest burden, suspended between heaven and earth. She was the perfect image of a quaint old church lady, with brown curly hair, gentle winkles on her face, round cheeks and bright blue eyes, bending over a prayer book. Coming into the chapel, I immediately spotted her and drawn like a moth to light, sat next to her. I set my leather-bound Christian prayer book on the seat between us, where her well-used Magnificat rested. Curiously peering, I realized she was praying the Breviary. She prayed the prayer that I had just prayed, said the very same words I said less than five minutes ago. The beauty and timelessness of such united prayers made my heart soar! Staring forward at the clean, barren altar, I tried minding my own business but another book on the seat between us caught my eye. 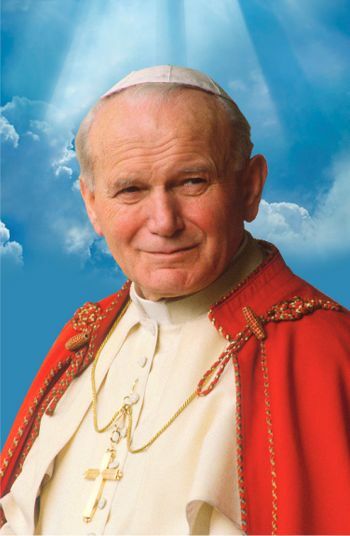 On the cover, against a sky blue background, was a picture of Pope John Paul II leaning against his silver staff, eyes closed in a meditative gesture. The title read “Saint John Paul the Great” Instantly, I picked it up. The old lady finally noticed me, holding the book in my hand. I felt a tinge of fear yet did not stop smiling at the beautiful cover. She leaned over and whispered, “You may have it.” “Thank you!” I whispered back. After Mass, I introduced myself to the lady, thanked her again and told her that I had just been asking John Paul II to intercede for me. “He must be your special protector,” she replied. Indeed those words were so truthful for throughout this week, I had noticed a protective presence watching over me. Now I know who it was. And now I know who, when I called out last night, heard and answered. Mass ended. Joy still flooded over me. I had been smiling so much, my face almost hurt. Feeling well-fed and recharged, I finally met the one who I’d been longing to meet. Finally I shrank away, worried I’d talked too much. A young man approached, shook his hand and asked to have his rosary blessed. I suddenly remembered a rosary in my purse, which my non-Catholic brother gave me, and quickly had this blessed as well. Watching him sprinkle holy water on the rosaries, the smiles started up again. Joy bursted from within me. I headed for the main church to say my thanksgiving and yet, found the priest there again, preparing to hear someone’s confession, removing his chasuble. “Father let me take that,” I said. “Here, take the stole too,” he replied, handing the precious vestments to me. A most awkward march to the sacristy ensued. In my joyful stupor, overwhelmed by what seemed to be Christ’s garments wrapped around my arms, I had no clue what to do. The sacristans darted in and out, shooting odd glances, wanting me out of their territory. I folded the stole nearly perfect, as I’ve seen them done before. With the chasuble, I had notably less luck. It was like folding a fitted sheet. No matter what I did, it wadded up, so I wadded it the best I could. Seeing the note I’d left for him yesterday morning, I swiftly grabbed it, put it on top of the folded vestments and retreated out of there. The sacristy is unpleasant. It’s an overwhelming place of sweat and tears, altogether like the garden of Gethsemane. Emerging into the church’s vestibule, I crossed paths with the priest. I informed him that I folded his vestments the best I could. He said it was fine. Inadvertently, I followed him, wanting to hear a critique of the folding, hoping to see how it was correctly done. I halted at the sacristy door. I couldn’t leave the church yet for there was one last thing to do. Alone, at last with my Lord, I knelt down before the tabernacle and out-poured thanksgiving. My praises mixed with a most-foolish joy, with tiredness and awkwardness, the entire placed in Jesus’s loving hands. Images of the Mass flickered in my mind, of the host held so peacefully in the priest’s hands. The voice of his chant still rang in my ears. My gaze turned to the sanctuary lamp, burning bright red, a pillar of fire in the darkness. I thanked Jesus for the gift of Himself, and for his other self back in the sacristy, probably reading the letter and scratching his head…and for his other, other self, who was getting some much-deserved rest. It was after all, the parish priest’s suggestion that the visiting priest said Mass this morning and at this moment, I believed he did it just for me. Everything seemed like love- for I was intoxicated with love. Then, I closed the heavy church door, saying a silent farewell to both of my Christs. How fortunate indeed am I, who is relentlessly pursued by God. This morning, before Mass, I went into the main church to chant lauds. There was older gentleman in black, up by the tabernacle and I hoped it didn’t bother him. Anyway, after I finished I went up to the tabernacle and discovered it was a priest! I felt so bad for subjecting him to my horrible Latin. But I felt even more glad to see him there, praying by himself before Our Eucharistic Lord. In his clericals too! The Eucharist is sadly, not a big deal at our parish. Jesus is shoved into a corner and mostly ignored. But here was a priest, silently adoring Him. On the chair in front of him, lay a beaten-up, well-loved breviary, while the Christian prayer books in our church are brand new, barely used. Seeing this intensity of devotion, which is so rare, moved me so greatly, I could barely keep it together during Mass. He was a visiting priest. He didn’t say the morning Mass but rather, I heard, he was going to say his own private Mass later in the day. Again, I was moved beyond belief. I suddenly longed to find this man, this perfect image of the priesthood, hug him and tell him what a badly-needed exemplar he was. Yet, after Mass, he disappeared. Our parish priest bolted out the door. Catching his attention for one moment, I said “Father, I care a lot about you.” Thanking me with a quick gesture, he continued his flight from the church. The one I sought was nowhere to be found. I remained in the church, speaking with Our Lord, beseeching him on behalf of these two souls, my gaze constant upon the red, sanctuary lamp’s lonely flicker. Drawn after the Lord, I went to Mass again this morning. I prayed in front of the tabernacle, remembering the mysterious, visiting priest who’d been there the morning before. I chanted lauds quietly, wondering in the back of my mind if I would ever meet him again. Time for Mass drew closer and I whisked away into the chapel, where lo and behold, preparing the altar, was the visiting priest! From his movements around the sacred altar, bowing here and there, I could tell what sort a priest this was. This was a priest who took great care with the liturgy, who would give me something new. For the Mass, we celebrated the Queenship of the Blessed Virgin Mary. My heart sang and rejoiced! He chanted the Kyrie in Greek and several other of the prayers were chanted as well. He handled the consecrated Eucharist: the body, blood, soul and divinity of Our Lord, with such care and love- as one would handle a tiny, newborn babe. I walked up to receive communion as the priest softly said “Corpus Christi”. I couldn’t believe it. My ears rejoiced at hearing Latin, what seemed my native language! He placed the Lord Jesus gently on my tongue then continued to softly speak the Latin words to others who approached. Beneath this living image of Jesus, who diligently feeds his flock, a feeling of safety, joy and peace filled the room. Everything seemed frozen, wrapped in bright light, white and fresh. My head sunk into my hands, I closed my eyes, and rested in God. A discussion on the Mass cannot be separate from a discussion on the gift of the priesthood. 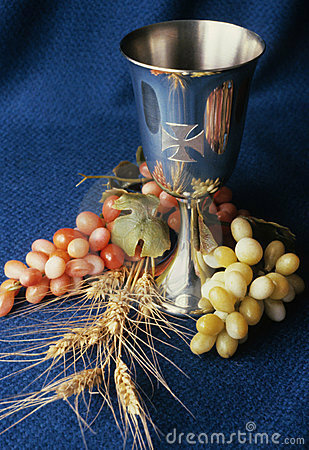 Crowing the offering of the priesthood of believers, God’s ministerial priests make the Eucharistic sacrifice present. The word “priest” means one who makes sacrifice. Chosen from among men, he presides over the banquet of love. As “another Christ” his hands, voice and body become the very instruments of Christ, used to pour out every kind of grace. The priest’s vocation is to be steward of all gifts which the Mass imparts. We see clearly that his actions, words, prayers and vesture have something to teach us about the gifts. Gold in the vesture of the priest is not belonging to the man, but to God’s presence which wraps him as a mantle. We think of how the prophets of old chose their successors by placing their mantle upon them. We think of how Christ elected his own apostles and remember that every priest is enrolled in the apostolic ministry of preaching the Gospel to every nation. The oil of a priest configures him especially to Christ. The outpouring of the Holy Spirit burns a brilliant seal upon his soul. It is the oil of gladness, of Our Savior’s eternal priesthood. He goes to the wellspring of Christ’s own life and draws out the Eucharist from which we all drink. He gives us the sacrament that heals, atones and saves. During the elevation of the host and chalice, let us imagine that oil is being poured out over the people, cleansing us, strengthening us, making us new. When the priest prays quietly at the altar, he is praying for himself- and for us. Jesus’s disciples asked him: “teach us to pray” and this is what the priest does. Like the Good Shepherd who leads us, he teaches us a silent way of prayer, of turning our eyes to the Heavenly Father and trusting in Him. He lifts up his children, diligently cares for them and feeds them honey from the promised land. The priest does many acts of reverence during Mass. He bows his head, lifts his hands, makes small crosses and big crosses. Genuflecting before the consecrated Eucharist, he shows adoration for Christ. We worship with head, hands, feet and lips because Christ became man and worshiped his Father in this way. Watching these gestures and responding to them, our whole being participates in the Holy Sacrifice. Lastly, the priest works hard to provide for our nourishment. He spends many hours in toil, tending to the sick, weak and spiritually wounded. His celibate fecundity and wholehearted devotion become rich milk flowing in the desert. By laying down his own life for us, he provides us with a model of Christian living. In following self-abandonment, we find true happiness. What a happy sight is a priest wearing his collar amidst a bustling, public place! The priest is a quiet, humble enduring token of God’s presence with us always. The Milk of the Mass. The Mass is comprised of two parts: the Liturgy of the Word and the Liturgy of the Eucharist, which provide nourishment and strength for our souls. We “feed” on the Word and then on the Eucharist. Their source is in Christ, the true life of the Church. What the Holy Scripture speaks of in figure, prophecy and the words of Christ, the Eucharist fulfils. We learn of the true manna from heaven, sit at his feet, and then feed upon Him. This is the milk of the Mass, which flows freely from Christ and is a supreme gift to all who believe. All of the other gifts pass through and originate from these two teats by which the Holy Church feeds her hungry children. This is why we refer to the universal Church as “Mother Church” because she embraces and feeds people of all nations, helping them to grow into saints. Through the liturgy of the Mass, something divine descends upon us, making our hearts grow bigger, stronger and able to make more room for God’s love. As we become mature Catholics, we will draw from the ample fount of the church’s milk time and time again. Listening to the Gospel, we digest the message, letting certain words come to us and as Mary, ponder the meaning in our hearts. In such sweet instruction, we learn to become a holy people, in stinging rebuke, we notice areas that must be improved. This is the milk working in us, to bring about Christ in us. Ingesting the Eucharist unites us with Christ. Scripture says: “A man will leave his father and mother and cleave to his wife- and they shall become one flesh”. At the moment of consecration, Our Lord leaps down from heaven’s height and takes shelter in the hands of the priest. As the canopy of love is raised over us, Christ comes forth. The one true Savior, concealed under the appearance of bread and wine, dwells in one flesh with his people, his bride. With each reception of Holy Communion, we grow more and more like Christ, our Divine Spouse. In essence, we become what we eat. What makes this mystery even more beautiful is that it is God’s work, not our own. This is the paradox of Christianity, the Living God who did not deign equality with God but became a slave. We are the truly poor ones but he becomes a poor one, ground by our teeth, totally annihilated out of love. That which is high is made low and that which is low is made high for from our feeble, sinful lays, we are called to partake in his riches. 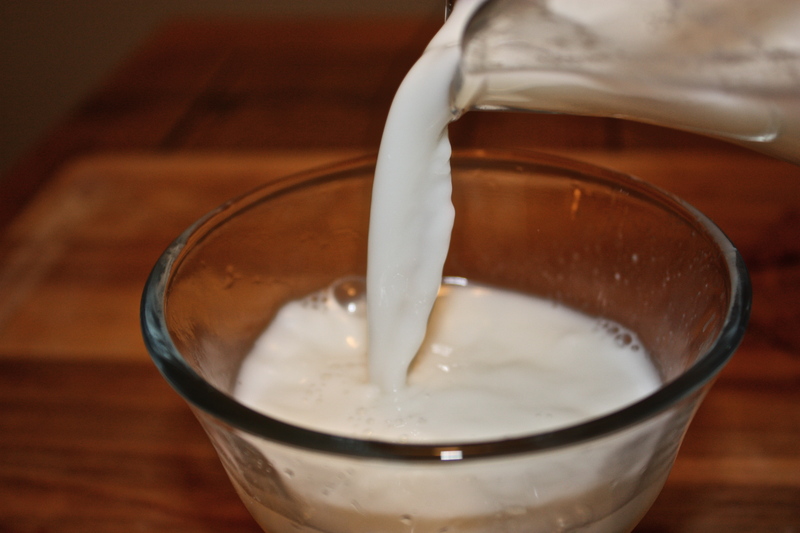 When Scripture says, “Man does not live on bread alone but by every word that passes from your mouth,” we hear a reference to this sublime milk, offered in both the Gospel reading and the Holy Eucharist. For God’s word speaks to us in holy writ and it is the word of God, uttered through the priest that transforms mere bread and wine into the body and blood of Christ. At the powerful word of God, every gift of the Mas springs to life. In a new creation, this life throbs, flows and covers the earth. It is important that the Holy Sacrifice of the Mass is prayed, lived and absorbed into our very being. How rich and blessed are we to be partakers in such choice, divine foods! The Wine of the Mass. This disposition of reverence is the wine of the Mass. Our chanting, our vigils, our candles brightly burning are all signs of a people enamored by God’s presence. These things all serve to foster a union with God. They help us understand who God is and how we respond to Him. Reverence is the song of the wedding feast. We behave differently at Mass than in the outside world. Feeling a sense of the sacred, our minds cease their restless churning. The structure and solemnity of the Holy Mass brings peace. It conveys a respect for the Lord’s house. In order to drink more deeply of the sacraments, we must lower ourselves, be humble and meek. It is then we hear what God is trying to tell us. 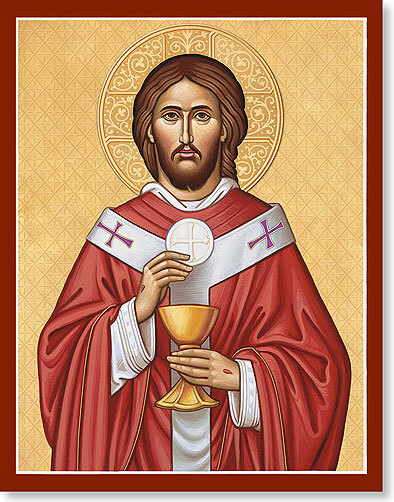 Before approaching Holy Communion, we drink the cup of reverence which prepares us to drink the Saving Cup. Our palates are softened to receive the Living God. To some, reverence is foolish, the dusty remnants of an old religion that lacks contemporary value. But nothing is further from the truth. Amidst materialism, reverence points to something higher. In a world of darkness, reverence sows light. We exert ourselves in charity, feeding the hungry caring for the sick, ministering to the sinner. Having drunk our fill, we may even give our very lives. Capable of so profoundly moving us with love of God and neighbor, wine is corresponds to the end of the Mass, which is adoration. Wine is intoxicating, like the powerful, just and merciful presence of God, who loves us beyond measure. Our minds reel at such a love! Running and warm, it also becomes the precious Body and Blood of Christ, who intoxicated by love for us, gave up his life on the cross. Enlivened by this spirit, let us run to the King and Bridegroom of our souls! Gifts of the Mass, Part 3- Honey. The Honey of the Mass. There are some things about the Mass that we can just savor. In a sacred place, praying silently, folding our hands, perhaps whispering, we are comforted. Eyes closed, hearing a gentle hymn about the mercy of God, we are given hope. Seeking him, we know he seeks us. This is the honey of the Mass: God’s peace, which the world cannot give. The soft prayers, small gestures and mumblings of the priest are soothing to watch and hear. A pilgrim people, we are nestled in the arms of God, and there, tell our many petitions. 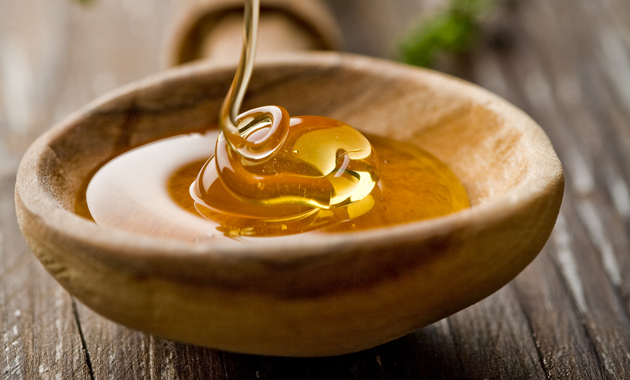 Honey shows our special relationship with God. Our liturgical gestures reveal a people conversant with God, knowing him as both friend and lover. Every movement is charged with meaning, every word profound. Listening to the Gospel, let us remember that His word is like a honeycomb, beckoning us closer. As the priest recites prayers we may not be able to hear, remember that Jesus often went alone to pray. It reminds us to watch and pray. You may notice that the words said at Mass have a set text. They are moreso echoed in every Catholic Church around the world. These petitions, handed down in the Church’s wisdom, are the prayer of the universal people of God who intercede for the world. We don’t just recite these prayers, but enter into them, learning their meaning as we hear them again and again. And how sweet the words of Jesus that flow from our mouths when we say: “Our Father, who art in heaven”? Our prayers join with those of the whole Church and Christ, who is the Head of the Body, prays with us. In receiving the Holy Eucharist, God becomes our humble guest. In silence, we talk to him, tell him our many needs and the needs of others. At this time, we might say private prayers in our hearts. Because it is savored so long in the heart, honey characterizes the end of the Mass which is petition. In our desert lives, it is necessary to seek refreshment. The sweetness of the Mass gives us energy to confront a world that is seldom peaceful. Jesus came to give us peace, to bring good tidings to all men. He taught us how to pray and united with him, we worship the Father. Our lasting union with him, is supreme happiness. In him, is our hope and the Mass reminds us of this time and time again. In his body, he died, rose and ascended. Knowing that Our Lord and God endured the hardships of life, gives us courage to face our own trials. Honey sweetens the vinegar of suffering. 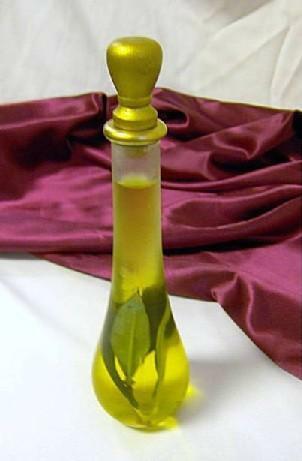 The Oil of the Mass. We each bring our own offering before God in the Holy Mass. In union with the priest, we lift up our hearts. The oil of the Mass, is our hearts, our prayerfulness, our awareness of who we are, the priestly people of God and what we are doing, offering sacrifice. It is also the crowning delight of the Mass, namely, God working through the priest. In our commingled offerings, a pungent fragrance is released. Spreading upward on our prayers and petitions, it fills the house of God. A priestly people, we are anointed by God’s presence in the sacraments. In the Mass, our oil runs over. It exalts, it strengthens, heals and saves. This is most apparent in the consecration of the Holy Eucharist where a broken, sinful man calls down all the powers of heaven and cradles Christ in his hands. How awesome, the calling given to us, that we may share this incomprehensible blessing! In union with the priest, we offer the greatest sacrifice! A zealous priest, in love with this sacrament of sacraments, gives forth finest oil. He has given everything, laid down his life and bursts with joy at being made a sweet oblation. The proper disposition we should carry during the Mass, is of self-sacrifice, being conformed to the salvific sacrifice of Christ. We continually apply the oil to ourselves that we may be healed and brought closer to our original dignity, that of our first parents before the fall. Thus, oil corresponds to the end of the Mass which is atonement for sins. The name “Christ” means “anointed one” and we bear his name as Christians. On our foreheads, is the seal of his kingship. Oil spreads by virtue of its thick, moist consistency. Therefore, as a community, our oil is gathered and lavished upon others. Our anointing doesn’t run out as soon as we leave the church but rather must be spread onto the entire world. Oil is also a fuel. Filling our lamps with it, we burn brightly. This means that instead of hiding under a basket, we teach the truth. And if our lamps should run dry, we are invited to return to the most holy Eucharist and be refilled. The oil of Christ never lacks. His priesthood, and thus our priesthood, lasts forever. The Holy Sacrifice of the Mass is the most-perfect gift in which God gives himself to man, and man gives himself to God. When we go to Mass, a banquet is spread before us full of splendor, richness, sweetness and praise. God’s goodness overflows. As a Protestant, I couldn’t really see God’s love for me, nor touch or taste it. God was an abstract person, far from us, that the preacher only talked about. Yes, he did tell us to “accept Jesus into our hearts” but this sort of prayer seemed like an intellectual exercise. When I finally discovered the Catholic Mass, I was able to say, here is truly the outward manifestation of God’s love for us! In the act of receiving communion, believed to be the actual body and blood of Jesus, “accepting Jesus into your heart” became more than just an idea but a real, concrete thing. The Mass is our “Mysterium Tremendum”. It is the kingly, priestly and prophetic prayer of the entire people of God. Both a banquet and a sacrifice, it reopens every grace bestowed to us by Jesus on the cross of Calvary. In a lifetime, it would be impossible to understand all that happens at the Holy Sacrifice of the Mass or count all its gifts. Before such a tremendous mystery, we can only reflect on bits and pieces until the whole is revealed in heaven, where at the altar not made of human hands, we will worship for all eternity. The following gifts I now reflect on are just a foretaste of what God prepares for us, that which eye has not seen and ear has not heard. When the sweet smell of incense rises in smoky curls, the organ thunders and heavenly strains of Gregorian chant hit your ears as you see the priest process by wearing vestments that shimmer like fire, you are experiencing the gold of the Mass. These are the outward treasures of the church proudly displayed. While such beauty may consist of expensive materials, they speak of the treasures of heaven rather than earth. We do not count the cost of this perfume poured out in devotion, for God is master of all things. Some may deem beauteous things as mere externals however, we know their true purpose: our senses, sight, smell, sound, touch, are guided to heavenly realities. Mysteries are brought low, so that man may taste and see. We see before us, entrance into that paradise lost and a foretaste of eternal delight. A lavish wedding feast calls our attention, our minds and hearts. The gold of the Mass is the priceless adornment of the temple of God, which should match the adornment in our heart. Since we cannot see the hearts of others, we are shown something to strive for, the adornment of virtue, faith, hope, charity. It is also a reminder of God’s greatest gift to us, His Only begotten Son, who was incarnated of the Virgin Mary and became man. The Lord of all creation became poor so we may be rich. He became human so we could become divine. Gold was presented to the newborn babe in Bethlehem, placed before the manger of the King of Kings. Now, chalices and plates of gold are a fitting throne for Him. From a gold vessel we receive something infinitely more precious than gold. We receive the price of our redemption: the blood of Jesus Christ! The beauty of the Mass summons our collective memory as ransomed people of God, no longer slaves but friends and servants of the most high. A royal priesthood, whose bonds have been loosed, we stand and give thanks to God, carrying our gold, singing our song of victory. 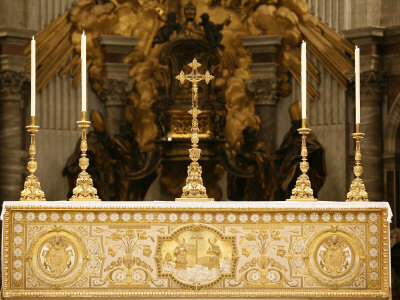 Thus the gold corresponds to the end of the Mass which is thanksgiving. Mary, Help of Christians, pray for us. Adoramus te Christe, et benedicimus tibi quia per sanctam crucem tuam, redemisti mundum.